Thank you for watching my new series George Hirsch Lifestyle on your local public television and PBS stations during the past few months. I am delighted to share with you that in addition to the national scheduling on your local station, GHL will release next month on Create TV on over 200 plus stations nationwide. And, I appreciate all your sincere well wishes you have offered on my new TV series! 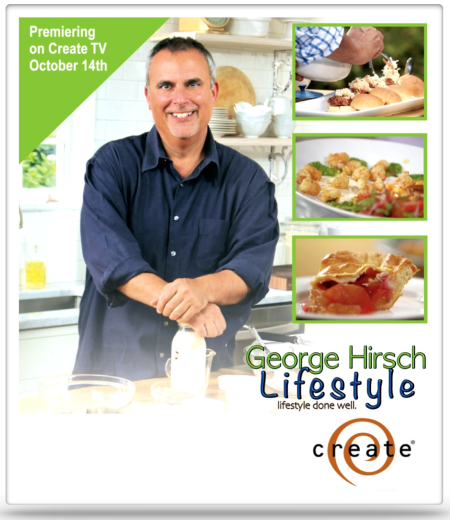 The popular public television series George Hirsch Lifestyle, featuring celebrity chef and author George Hirsch, premieres on Create TV October 14! Join George in his Hamptons kitchen as he shares his deep culinary knowledge and well-honed techniques for the home cook. Check CreateTV.com for air dates and times. Since January 2006, *APT has distributed Create® TV, the dynamic 24/7 digital channel of popular lifestyle programming. Its do-it-yourself genres include the best from APT’s extensive library of cooking, home-improvement, gardening, painting, crafts and travel series, as well as well-known titles from NETA and PBS.